Candelaria Silva gave me permission to repost her essay on how the internet has helped her to stay in touch with her grandchildren and enriched her life in innumerable ways. My daughter’s internet search skills uncovered a half-sister I didn’t know I had and found my biological father whom I hadn’t heard from (or even thought was alive) for 40 years. She is the keeper of the family tree on Ancestry.com and has gathered photos from relatives via postal-mail that do not have email or computers that she uploads onto the My Family and Ancestry accounts. She has traced the family on her father’s side back into slavery times with the aid of on-line resources. Her activities have gotten some of our computer-phobic relatives to get on board. On Facebook I have been pleasant surprised by the number of connection requests I've received from many of my children’s childhood friends who remember the special meals, overnights and adventures we shared and reach out to connect to “Miss Silva” as they call me (no matter how many times I told them to say, “Msssss. Silva” because I haven’t “missed” anything). The webcam and the application Skype have allowed me to reach across the miles and read books to my granddaughter, sing songs with her, watch her as she twirls around and takes a bow, or just plays in the background as my daughter and I have a virtual visit. My granddaughter knows me and is not shy when we see each other face-2-face. I AM HER NOT-SO-DISTANT GRANDMOTHER AFTER ALL! Skype also allows me to look into my drama-prone daughter’s face and see how she is really doing beyond what her words say. Getting the rest of the family to Skype has not proven easy and I’m talking about the ones who already have computers. You would think I was asking them to fly to the moon. Except for two cousins, who also happen to be sisters, none of the family has gotten on board. We do, however, have an Uncle who forwards every joke and rumor on the internet. He doesn’t write messages or notes himself, rather he passes along jokes. Expecting this I can open them or not. This is his way of staying connected. Before he got a computer, we never heard from him at all. Other relatives will occasionally upload a photo every now and again. Still others are sharing recipes. In the past year, my siblings have now begun to communicate more regularly via email than they ever did with postal mail. The three of us used email to plan the surprise party we gave my mother and stepfather for their 75th and 81st birthdays, respectively. It was an efficient way to share research, organize the details and update progress. Technology is neutral; it is we users who determine its value. I have noticed that younger family members and friend play more with technology in ways that seem frivolous and often too revealing to me. I don’t want “ghetto snacks” or “to see what kind of gangsta I am” and other applications on Facebook. I have disconnected with many people who sent too many updates. Most of my family and friends within my age range use technology to communicate longer thoughts and ideas and rarely engage in shorthand statements. I recognize and work with our generational differences. At least we are communicating! Internet technology is my friend and when it isn’t, I love the fact that it has an off-button that I can use to keep it from encroaching on real interactions in real time. The internet is keeping my family connected and shortens the physical distance that separates us. Before too long, I know that I will have my mother, sister, brother and son on Skype and we will get to see each other’s faces whenever we want and not just the once or twice a year when we are in the same place. I also anticipate it becoming commonplace for us to video conferencing capabilities to share weddings, graduations, and other events when cost and time concerns prevent some of us from getting to special events. Watching the film clips about the Kennedys was like re-living my life. I came of age in the 60’s when the world was changing in all kinds of wonderful ways—racial barriers breaking down, patriarchy challenged, opportunities opening for women. The Kennedys were sometimes given credit for the incredible sense of possibility of those days, but the Kennedy brothers were responding to something bubbling up from the ground. Life was not kind to us 60’s activists. As we entered our middle years with all the inevitable personal disappointments (marriages failing, career goals unrealized), we also had to deal with all those dreams from the 60’s crashing down. The long backlash against the 60’s which began with Nixon turned into a full scale assault with the election of Ronald Reagan, followed by all the disappointments and missed opportunities of the Clinton years and then the eight year horror of George W Bush . But Ted Kennedy kept fighting the good fight through it all. As the years passed, I grew to respect and value him more and more. His last gift to us was his early support for Barack Obama, who may not have won the primary without it. I never thought I would live long enough to see the election of an African- American president. I was an early Obama. supporter, although I didn’t come out of the closet until after Iowa. (As a NOW chapter president it was a little dicey.) 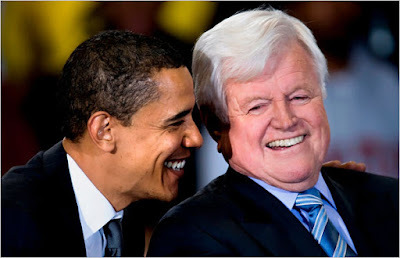 Ted Kennedy and Carolyn Kennedy’s early support gave me (and no doubt many others) hope that Obama could make it. And that sense of social possibility includes gender equality as well as racial equality. Watching all those film clips of Jacqueline Kennedy, I could not help but think of the dramatic contrast with Michelle Obama. Jacqueline Kennedy was beautiful in an almost unreal fashion model sense, but a deferential wife with her wispy little girl voice, silently enduring her husband's serial philandering. Michelle Obama is beautiful in a strong, athletic real woman sense, a Harvard trained lawyer with a confident voice, in a marriage which is clearly a loving partnership. We have come a really long way. The long backlash against the 60’s appears to be finally over. Sure we have the crazy birthers and the tea-baggers. There are enough of them to create a lot of noise, but not enough to muster an electoral majority. There is so much work to be done. It’s tragic that that Kennedy did not live long enough to see national health care passed. Let’s hope that his memory inspires others. Supposedly one of the consolations of getting older is that people get less neurotic as they age. I don’t know if I’m less neurotic in general, but I sure am less neurotic as a gardener. For one thing I don’t obsess about dead plants. My guess is that I’ve lost about one third of what I’ve planted. From my unscientific survey of other gardeners, this seems to be par for the course. I’ve accepted the fact that some plants (like some people) sicken and die before their time. It happens. Also, I can deal with the fact that some of my friends think my garden is a chaotic mess. I’m more likely to get a negative reaction to my front garden since I eliminated the lawn several years ago. 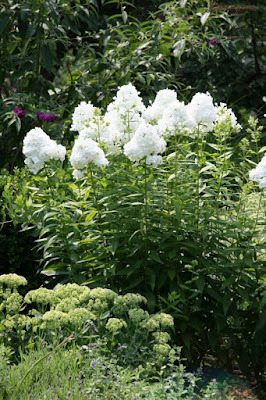 I get comments like, “this is a jungle!” or "this garden has no rhyme nor reason!” I really did try to plan the front garden with a restrained color scheme and repeated groupings of plants, but sometimes my friends just see chaos. 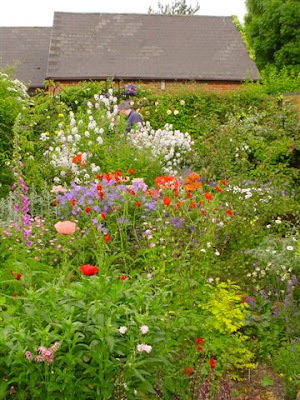 Austere Japanese gardens have always left me cold; I love the colorful jumble of an English cottage garden. If my attempts to recreate an English cottage garden in my back yard fall short, so be it. I enjoy every minute playing around in my imperfect garden. And those imperfections include the holes slugs chew in my hosta leaves, black spot on the roses, and powdery mildew on the phlox. I don’t use pesticides. There have been quite a few times when I’ve had a particularly bad infestation and I decided I'd had enough of this organic gardening. I’d go to a garden center and came home with some toxic substance, but then I would lose my nerve. Sure I wanted to get rid of the thrips on my glads, but I didn’t want to harm all the birds and butterflies. This pattern of buying deadly poisons and then shrinking from actually using them has been repeated many times. I now have a cabinet filled with really toxic stuff that I need to figure out how to safely dispose of. But I am no longer tempted to seek a final solution for my garden pests and don’t expect to be buying deadly poison again! So my garden tips: accept imperfection. 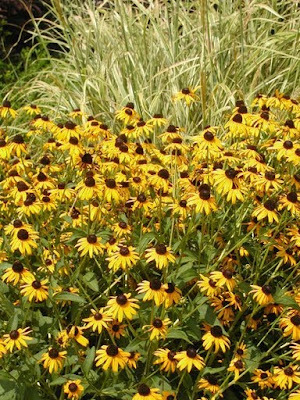 Plants will die and gardens will sometimes get out of control despite your best efforts. A chewed leaf or two is worth it to keep the birds, butterflies and beneficial insects happy! It took me a lot longer than it should have to get to this state of acceptance, but I think I’m there. The cicadas are singing a different song this year! My friend Fran Waksler sent a long, very interesting comment which may get lost in the comments section so I’m posting it as a separate blog post. Her response to the cicadas was very similar to mine. Every August I felt they were taunting me with their song that I heard as: “You have to go back to work. You have to go back to work.” Like Fran, this year I am hearing a different song. I’ve just read all the posts on your blog/website and found them fascinating. It led me to consider my retirement so I’m sending along some thoughts which you sparked. 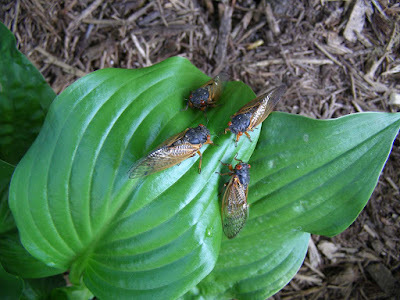 Every year the cicadas start singing on August 1. They always made me sad because it meant the summer was over and it was time to go back to school. I actually enjoyed the teaching itself, but increasingly the administrative oppression got to me. This year I happily looked forward to the cicadas and their signaling my new-found freedom, but, perversely, the cicadas made me wait. Finally they started on August 11. What a restful sound. Retirement is both a pleasure and a relief. Although I was at the same college for many years, in some sense I was always an outsider in terms of the faculty (not, fortunately, in the view of students.) My stress level has decreased markedly since I retired in December. A newly-retired friend described my feelings exactly when she said, “I wonder how I ever had time to go to work.” I’ve been writing, reading gardening, dog training., and going to the gym 3 days a week. I was able to write an article reflecting on the visit of first graders to a college sociology class (a yearly event for 13 years), get a philosophical/sociology book off to publishers, also sent out to publishers a children’s book I wrote, am looking for a publisher for a friend’s autobiography of her abusive childhood which I helped her write, am almost finished with another sociology article, and have a long list of next projects. I always found time to write but never found time to tackle the job of finding publishers and the process that my husband describes as sending out “applications for rejection.” Now, however, I’m determined to find homes for my writing. I too categorize my reading: theoretical works in philosophy and sociology that push me and that I have a tendency to get lazy about tackling; an odd assortment of nonfiction that includes semipopular scientific accounts, e.g., evolution, scientific frauds, antipsychology rants, gardening, dogs and dog training; and right now lots of mystery stories, my particular weakness. The only thing I’ve found difficult is that there still doesn’t seem to be enough time for everything. I thought I’d have lots of uninterrupted time, but life continues to bring interruptions. Fortunately there is always tomorrow. Be careful what places you revisit; sometimes it’s best to keep the memories intact. I’ve been making up my list of must reads and weighing the merits of rereading old favorites vs. reading new books. In a similar vein, my husband and I have been making lists of places we want to revisit and places we have never been to. When you’re in your 60’s, there are no longer limitless expanses of time; choices have to be made. Will some of the old favorite vacation spots disappoint just as some of those once beloved books fell short? I have had a travel experience similar to my disappointment with books I fell in love with when young. 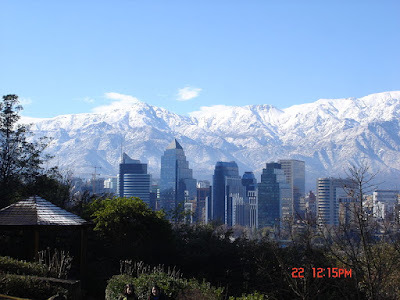 Several years ago, my husband and I went to Argentina and Santiago de Chile. I fell in love with Chile (or rather with the sense of social possibility I found there) when I spent about 5 weeks there in 1972. I spent a lot of time with young activists who supported the Allende government. We spent our evenings going to coffee houses to hear La Cancion Nueva—a hauntingly beautiful hybrid of Spanish and Andean folk music. When the Allende government was overturned in a brutal coup on September 11, 1973, I was stunned. Everyone I met was pro-Allende. How could this have happened? Some of the idealistic young people I met probably wound up tortured and killed by Pinochet. Off and on over the years, I listened to the music (the Parra family, Victor Jara, Inti-Illimani) and was thrilled when Michelle Bachelet (who was one of Pinochet’s victims) was elected president. I went back in search of the remnants of that culture. The coffee houses were gone (and despite the election of Michelle Bachelet) there seemed to be no trace of the once vibrant Chilean left. I thought I must be looking in all the wrong places, but a sociology professor I met in Buenos Aires confirmed that that there was in fact not much left. “The repression was total,” as he put it. One of my guide books mentioned “a human rights legacy tour.” It was a very expensive tour and I thought it might be too left wing for my husband, but he was willing, so we signed up despite the steep price. Despite this inauspicious beginning, the tour turned out to be worth it because of the driver. He was obviously a well-educated man who spoke several languages and knew a great deal about history and the arts. We guessed that he had probably been an academic—-a man of the left who lost his job in the aftermath of the coup. Those Allende supporters lucky enough to escape with their lives usually lost their jobs. Part of the tour involved a trip to the cemetery to see Allende’s huge, impressive tomb. 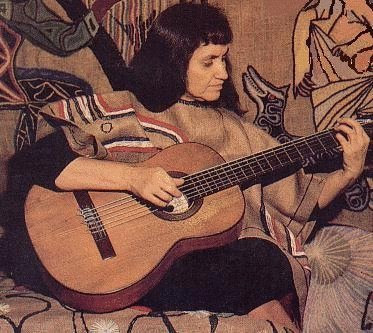 I asked our driver about Violeta Parra whose music had so much influence on La Cancion Nueva. To my amazement, he said, “She was a friend of mine and I can take you to her grave." The cemetery was enormous and finding an individual tomb was quite a feat. It was a relatively modest tomb and there were some flowers indicating that she was remembered. He told us the tragic story of her death. Violeta fell in love with a much younger man who left her for a younger woman. She committed suicide. I was familiar with her story but did not know what happened to the man who abandoned her. According to our driver, he married the young woman and they had several children, a very happy marriage, and both were still alive and well. That was not exactly what I wanted to hear. Now what were the chances of our signing sign up for tour with a driver who could take us to Violeta Parra’s and Victor Jara’s grave sites??? One more amazing coincidence occurred. We signed up for an overpriced wine tour. A meal at a tourist trap restaurant was included in the price. As we settled down to a not very good meal, a man in his mid to late 60’s walked in with his guitar. He had a long gray ponytail, shabby clothes and looked like a down on his luck 60’s hippie. Despite the election of Michelle Bachelet, the Chile I remembered was dead. Santiago was filled with ugly high rise apartment buildings, but the ring of shanty towns surrounding the city was still there--although the poverty did not seem quite as horrendous as I remembered it. There probably has been some trickle down. Anyway, the trip to Santiago was much more of a disappointment than my rereads of Russian classics. The moral (if any): of the story: Be careful what places you revisit; sometimes it’s best to keep the memories intact. Vacation Reading or how many trips to Block Island will it take before I finish re-reading War and Peace? Well, not exactly. All my life I’ve kind of divided reading into 2 groups: work and pleasure. There was overlap; books I read for pleasure sometimes wound up in my courses. Bur despite the blurred boundaries, there was always this divide. Now that I am retired, I have my history of second wave feminism in Philly in the work category (more about that later) and the books I cart to the beach in the pleasure box. The pleasure reading is in two categories: books I want to re-read before I check out and books I’ve never read. For some reason, I’ve been drawn to the re-reading category. A few years ago I started with Dostoyevsky. I spent my adolescence devouring 19th century Russian novels. Sad to say, re-reading Crime and Punishment was a horrible disappointment. I barely got though it. Next, I tried Anna Karenina. Reading it through a feminist lens was a very different experience than reading it as a teenager in the early 60’s. And I found Levin (the Tolstoy alter-ego character) insufferable. War and Peace worked out better than my other Russian re-reads. I’m in awe of Tolstoy's skill at portraying his characters’ mixed motives and the contradictory ideas they manage to hold in their heads at the same time. But despite my admiration for his genius, I only got through about ¼ of the book. When I got home I put it down and didn’t pick it up again for a year. And this was the book I once stayed up all night reading! I brought War and Peace to Block Island again this summer and got to about the mid-point. I enjoyed it even more this summer but haven’t picked up the book since I returned. How many trips Block Island will it take before I finish re-reading War and Peace? Anyone have experiences re-reading beloved books? Did they stand up to the memories?? ?